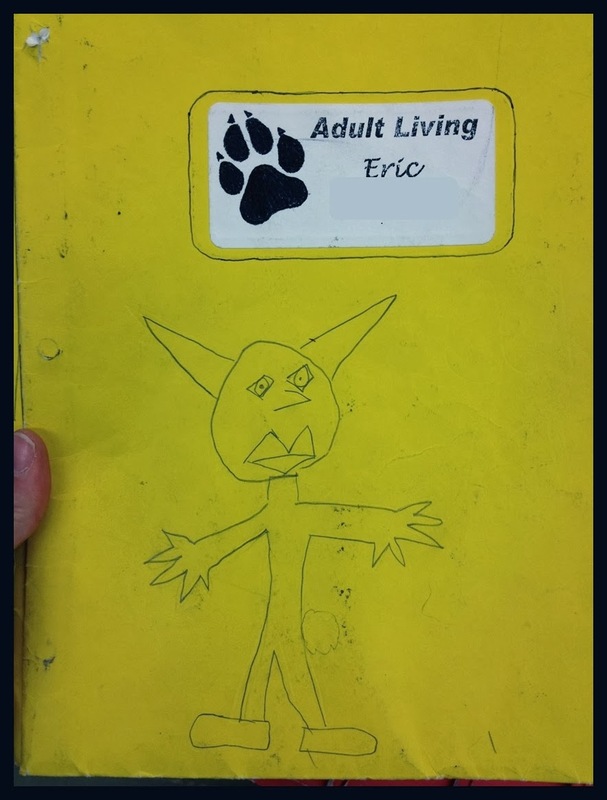 I provide a folder for each student. 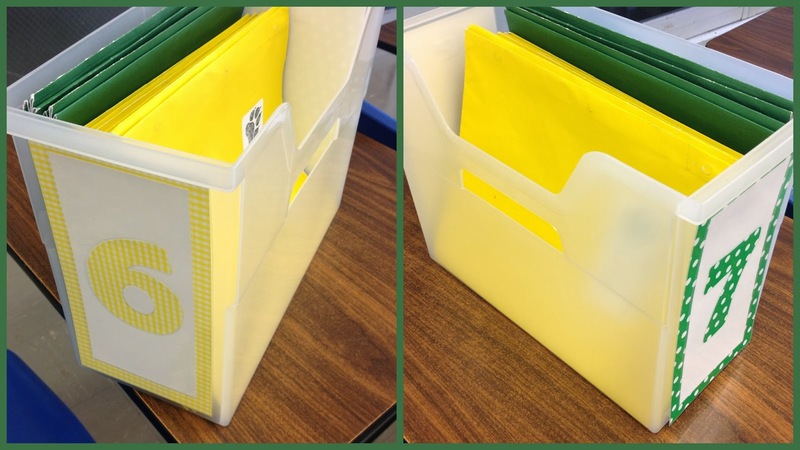 The folders are color-coded by class. 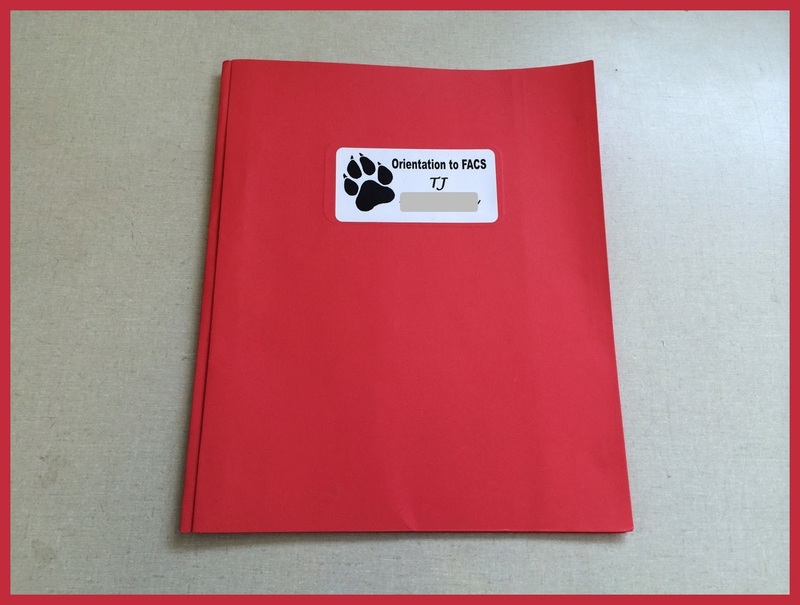 The front of each folder has the student's name, the class name, and a pawprint (for our mascot). 3) Grade labels - every week when I return their graded folders, I write their current percentage in the class in the space for that week. Not only do they know exactly what their grade is, but they can tell if they're going up/down and at what pace. Takes care of the kids/parents who tell me "But it was an A- last week - how can it be an F now?" This was the first semester I tried this - the kids LOVED it. Attached to the take-home syllabus is the form for the parent/guardian to sign, and instructions for how to sign up for remind101. 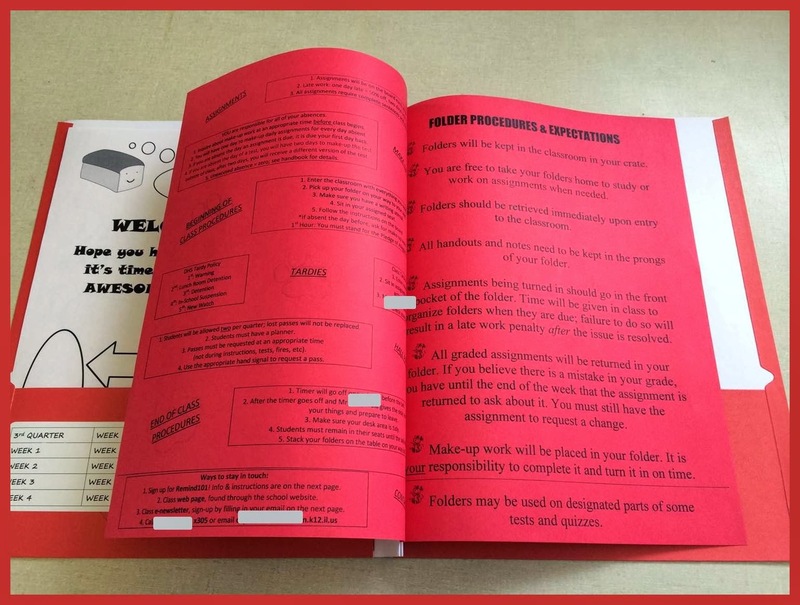 Back page of syllabus, plus Folder procedures and expectations. Instead of passing out papers, I tuck them into the folders. Sometimes I put in everything for the week, sometimes just the day - depends on what makes the most sense for that particular lesson. Students keep work to be graded in the front of their folders, notes/handouts go in the prongs. The day they are due I take about 5 minutes out of class to make sure they know what order their papers in the front pocket should be in, what papers should be placed in the prongs, and allow them to prepare their folders for grading. If they just sit there, ignore me, and turn in a great big mess, I do not treasure hunt; I will not grade it. Now obviously not everything we do is paper-based; a lot of what I return are project rubrics, feedback forms, etc. I grade the folders every week, staple all of the work along with a copy of the itemized grade report together, and place it in the back of the folders. I also write their current percentage on the grade labels. On Mondays, I take the first few minutes of class to have them look over their grades and their work. If they have any questions or see any errors I may have made, they have that week only to question it (that way they still have the work in question; eliminates the accusations right before report cards that I "messed up" their grade). The last "first day" page is a summary of the procedures/expectations for when a sub is in the class. These have helped tremendously over the years. This is the last piece of paper that I place in their prongs myself; the rest of the semester they are in charge of placing their notes/handouts in them. High schoolers are much better at operating these prongs that junior high students, but the first few times it's a REALLY good idea to explain how they work AND walk around and make sure they do it right. Seriously. And again, I designate time for them to do this the day the folders are due, so no excuses. The last thing I set up in their folders are their hall passes. Every student is given two hall passes per quarter to leave the room for any reason (bathroom, water fountain, locker) - that's it. Unused passes can be redeemed at the end of the term, the "rewards" vary. I'd say about 95% of my students this past semester didn't use any of their four passes, so this is very reasonable, at least at my school. 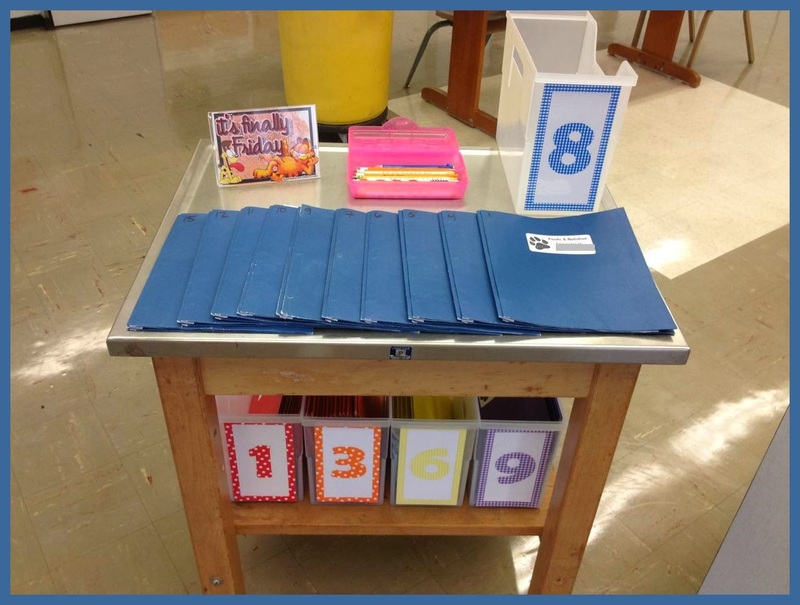 Folders are kept in a labeled file crate in the classroom. Before class I spread them out on this table which is directly in front of the door as they come in. I write a number at the top left of each folder, so that students can easily find their own without knocking everyone else's on the floor. When they leave, the kids drop their folders in the crate. I pick up the stack on my way out to hall duty, and put them in numerical order as I rule the halls with the iron fist of justice. I keep the crates below the table, so they're easy to switch out. If I have a smaller class or two, I combine crates to save space. 1) The first time you assemble the folders, it will take a long time. It will go significantly faster subsequent times, especially since you will obviously recruit students to help you : ). 2) The whole grading/printing grade report/stapling/writing grade percentage routine probably sounds time consuming. I've found it actually saves me a TON of time, and extra hassles. -I never have to take time out of class to pass out/collect things. -I never have to worry about keeping track of papers for absent students, because I've already put them in the folders. -Since all student work is kept in the folders, it has completely eliminated the student claim of "I turned it in! You lost it!" -Giving the weekly printout eliminates "I didn't know..."; also, it's easy to catch if I make a silly data entry mistake (like when you accidentally input a 20 point assignment as 200 points...). -I never have kids pestering me to see their grades because they know they will see them the first day of every week. I do have the occasional kid who wants to argue during the last week of the quarter, but they don't have a leg to stand on. -Filling in the percentage on a weekly basis forces me to stay on top of my grading so I don't get behind. -More than that, I am ready at a moment's notice for a surprise parent meeting or a last minute invitation to an IEP meeting, because I can just grab the student's folder and show numerical progress over the quarter (since I teach home ec, that's all the parents want to know from me - the grade percentage, nothing about their actual learning). Sad, but true. -So far I've only used paper folders, which really only last a semester. Since they only cost 10 cents a piece in August, I don't mind this - I just make sure I buy enough in July/August for both terms, because the price goes up to almost 50 cents a piece the rest of the year. -There will be kids who somehow manage to completely tear theirs up, even though they never leave the classroom. I make sure the kids know at the beginning of the semester that should such disaster strike, it will be their responsibility to fix the folder or replace it. In the correct color. -Be prepared for artwork to appear. Perhaps stress that any added decor needs to be school appropriate. So, that's my folder system. I love it - hopefully there was something in all of this that can help you out! I love this. Do you share your procedures/expectation pages anywhere? Would love to have a jumping off point to implement something like this. I would love to see the documents you place in the folders as well. This is a great idea! Fellow FACS teache here. LOVE, LOVE, LOVE this system. I as well would be interested in what exactly the forms look like that you give to the students! You have amazing ideas! I am also interested in what your forms look like. I tried the binder system this year but I may switch to folders next year. Binders take up so much space! please share your documents with us! I'll purchase them on TPT! I'll definitely be making these available soon - one more week of school, then time to play with it! Thanks for reading. We all would like to be able to use these, thanks ! 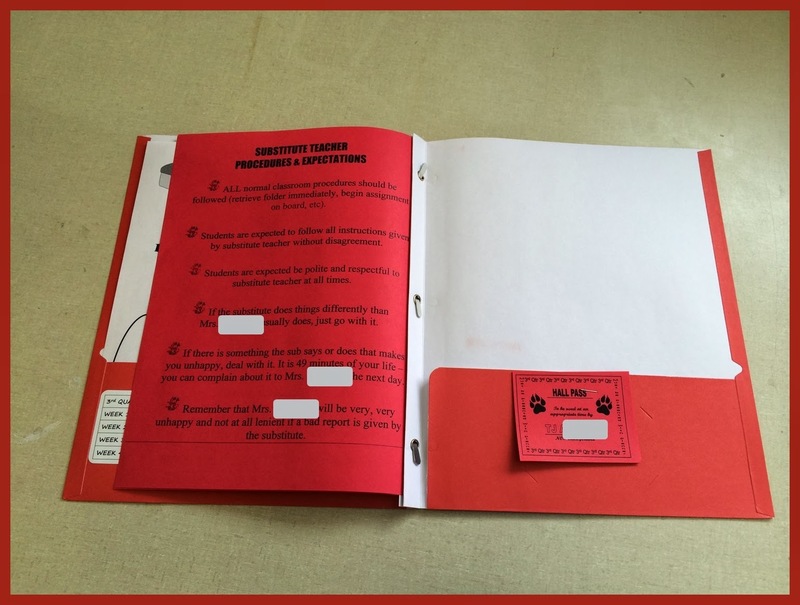 Would you be willing to post your bathroom pass template so that I can include it in my students' folders as well? Thanks! No one's ever asked for these! I will find them and post them this evening. Thanks for reading! Is there a link as to where I can find these? Hey Jennifer, so sorry, these took forever to find! Check it out here: https://drive.google.com/open?id=0B5QkK8sMpgX4SzZjalJhcTdwQlk It's a Powerpoint. I edit the student name, then copy the slide, edit the student name, etc. Then I print them six to a page. Hope this helps! I love you blog and I am going to introduce the folder method in my classes this year. I would love examples of your documents if they are available. Hiya! A few are already in my TPT store at http://www.teacherspayteachers.com/Store/Facsclassroomideas, and more are coming. This system has saved me so many headaches since I started it; I hope some of the ideas help you out, too! Thanks for commenting! Would the folder be thick enough to use with interactive notebooking? I doubt it. Hi Cathy, I also doubt they could pull off interactive notebooking - unless that's all you were using them for. If they were keeping all of their other class materials in there as well it would be quite a squeeze! Reiterating that I would love any of your documents :) I used a folder system last year with my 6th-8th grade Latin classes and I loved it!! I will be tweaking it some for this upcoming year, mainly with ideas from your system! Thanks for the post! Hello Bethanie! I am in the process of adding these to my TPT store at http://www.teacherspayteachers.com/Store/Facsclassroomideas . 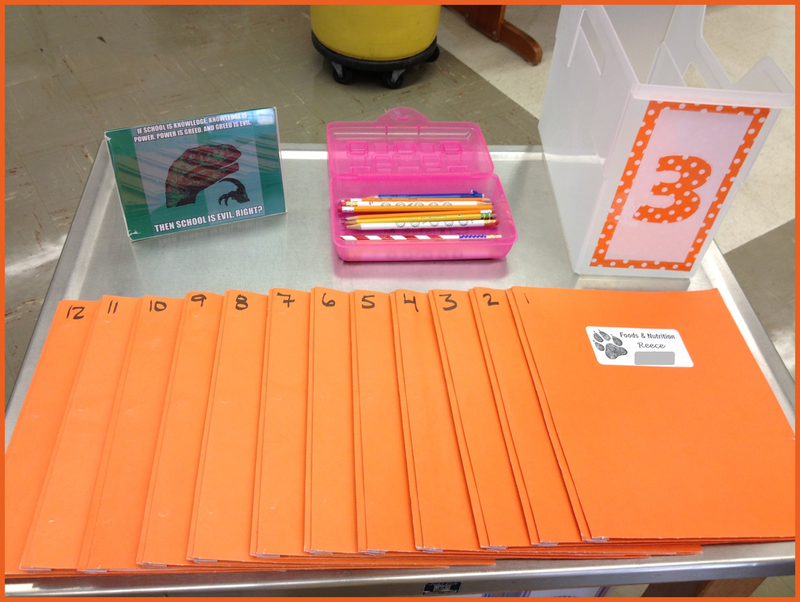 I hope these help in your preparation for the upcoming year - this folder system has worked really well for me! I also would love to see the documents you put into the folders! Hi Laura! I've begun adding these to my TPT store at http://www.teacherspayteachers.com/Store/Facsclassroomideas, and I'll be uploading more throughout this coming week. Thanks for asking! Please allow us to purchase your documents. Hi Cathy! I am slowly but surely in the process of uploading these to my TPT store at http://www.teacherspayteachers.com/Store/Facsclassroomideas . I'll admit it's taking me a ridiculously long time to get this going. I'm going to set aside some time this week to add several more items, as I know it's pretty much "game time" for getting ready for the new school year! Thanks for reading! I would love to purchase your documents. A few are already available at http://www.teacherspayteachers.com/Store/Facsclassroomideas , and I'll be adding more throughout this coming week. Thanks for stopping by! Thank you so much for sharing! Great Idea. I am teaching a new FACS course next year and I am stocking your blog for some ideas! I'm glad some of the ideas are helpful! Teachers need to share! Thanks for reading :). Hiya! I originally bought them from Amazon for just a shade under $4 each, but now they're list for over $10 each - ouch. Better to go directly from the seller, $5 each with free shipping - I definitely thought they were worth that amount! Good luck with your return to the classroom! Downloaded and ready to edit for my Foods 1 classes - thanks for the inspiration and organization. Tomorrow I tackle the new copiers. I hope. Oh goodness - how I know the joy and the utter trepidation that come along with a new copier! I hope the folder work well for you, they sure saved me a lot of headaches. Thanks for the shout-out on your blog, and good luck with flipping your classroom! This is fantastic!! Thank you for sharing! Where did you find your clear bins that you use to store the folders? I can not wait to implement this into my classroom. That post is two years old, so the prices aren't exact but I did check the links and they are still accurate. I highly recommend these bins - they look terrific, it's easy to see what's in them, and they hold up well under student abuse! Thank you so much! I seriously can not get enough of your blog! I wish I would have found your website earlier. You have helped to get me out of the end of the summer slump and a little excited about going back to work. Thank you again!